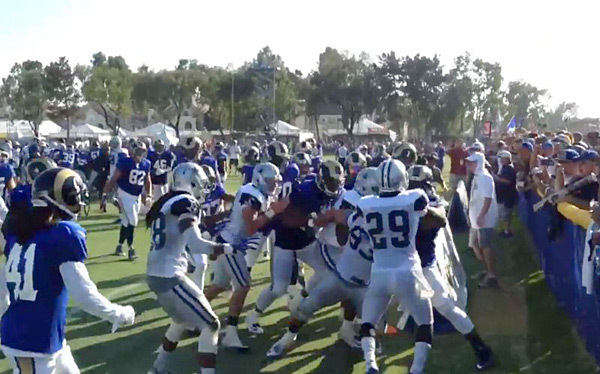 ​A friendly joint practice between the Cowboys and the Rams got ugly fast on Tuesday as the teams went at in a full-scale brawl. It appears the fight was started by Cowboys cornerback Joel Ross, who shoved Rams back Tre Mason before being pancaked by Rams guard Brandon Washington. From there it was mayhem as the players eventually wound up scuffling right by the bleachers and just inches from fans. Dez Bryant got nailed with a punch to the face, which led to a lost diamond earring and a funny World Star tweet. Only 22 days until the season begins! In late June, J.R. Smith opted out of his contract for next year that would've paid him $6.4 million. Less than two months later, he hasn't received any substantial offers and may have to accept the Cavs deal for less than the $6.4 million he turned down. In other J.R. Smith news, he just dumped his new girlfriend and married his old girlfriend (and mother of his daughter). Football players are using parts of their faces to hold the ball on field goal attempts. ​Mike in Albany requested photos of Diane Guerrero, who stars in Orange is the New Black. She earns today's LLOD honors (click here for full-size gallery). Adult film star Kleio Valentien, who played Rousey in the sure-fire Oscar contender Ronda ArouseMe: Grounded and Penalty, wants to go on a date with the MMA star. Can you guess which booty belongs to Serena? RIng of Honor champ Jay Lethal discusses the advent of his Randy (Macho Man) Savage character ... Brian Cushing trolled Starbucks on Hard Knocks ... People really want to buy that weird sketch of Tom Brady​ ... Philip Rivers celebrated his contract extension with Dominos ... Miguel Cabrera made one of the strangest baseball plays you'll ever see ... This is what Michael Jordan looks like in a Knicks and a Lakers jersey ... The Guardian has a good feature on roller derby ... I agree with everything Heath Evans said here about Roger Goodell and Deflategate ... Noah Syndergaard wants Amy Schumer to cast him in her next film​ ... Dave Dombrowski is in, Ben Cherrington is out in the Red Sox front office ... Google created an extremely simple Wi-Fi router ... The 20 best beers in the world. Sadly, Count Chocula Beer didn't make the cut. NC State defensive back Nicholas Lacy is notified that he earned a full-scholarship. Great speech by cornerbacks coach George Barlow in breaking the news. This season of Hard Knocks is turning into a J.J. Watt infomercial, but he's really entertaining so I don't mind. Growing up in Compton, Ice Cube and Eazy-E always dreamed of having The Muppets perform one of their songs.